I can't update the content in ViewPager. A question: What is the relationship and correct usage of methods instantiateItem() and getItem() in FragmentPagerAdapter class? This worked well (but as said I can't change the content). "My approach is to use the setTag() method for any instantiated view in the instantiateItem() method"
So now I want to implement instantiateItem() in order to do that. But I don't know what I have to return there (return is Object) and what is the relation with getItem(int position)? Currently I'm using getItem to instantiate the Fragment, is that wrong? But then do I have to put the fragments in instance variable, or not implement getItem() at all...? I just don't understand it. container The containing View in which the page will be shown. position The page position to be instantiated. Returns an Object representing the new page. This does not need to be a View, but can be some other container of the page. ... but I still don't understand how are they related and what I have to do. Here's my code. I'm using support package v4. When using FragmentPagerAdapter or FragmentStatePagerAdapter, it is best to deal solely with getItem() and not touch instantiateItem() at all. The instantiateItem()-destroyItem()-isViewFromObject() interface on PagerAdapter is a lower-level interface that FragmentPagerAdapter uses to implement the much simpler getItem() interface. if you want to switch out the actual fragments that are being displayed, you need to avoid FragmentPagerAdapter and use FragmentStatePagerAdapter. An earlier version of this answer made the mistake of using FragmentPagerAdapter for its example - that won't work because FragmentPagerAdapter never destroys a fragment after it's been displayed the first time. I don't recommend the setTag() and findViewWithTag() workaround provided in the post you linked. As you've discovered, using setTag() and findViewWithTag() doesn't work with fragments, so it's not a good match. The right solution is to override getItemPosition(). When notifyDataSetChanged() is called, ViewPager calls getItemPosition() on all the items in its adapter to see whether they need to be moved to a different position or removed. By default, getItemPosition() returns POSITION_UNCHANGED, which means, "This object is fine where it is, don't destroy or remove it." Returning POSITION_NONE fixes the problem by instead saying, "This object is no longer an item I'm displaying, remove it." So it has the effect of removing and recreating every single item in your adapter. This is a completely legitimate fix! This fix makes notifyDataSetChanged behave like a regular Adapter without view recycling. If you implement this fix and performance is satisfactory, you're off to the races. Job done. With this implementation, only fragments displaying new titles will get displayed. Any fragments displaying titles that are still in the list will instead be moved around to their new position in the list, and fragments with titles that are no longer in the list at all will be destroyed. What if the fragment has not been recreated, but needs to be updated anyway? Updates to a living fragment are best handled by the fragment itself. That's the advantage of having a fragment, after all - it is its own controller. A fragment can add a listener or an observer to another object in onCreate(), and then remove it in onDestroy(), thus managing the updates itself. You don't have to put all the update code inside getItem() like you do in an adapter for a ListView or other AdapterView types. One last thing - just because FragmentPagerAdapter doesn't destroy a fragment doesn't mean that getItemPosition is completely useless in a FragmentPagerAdapter. You can still use this callback to reorder your fragments in the ViewPager. It will never remove them completely from the FragmentManager, though. //don't return POSITION_NONE, avoid fragment recreation. 1- You must use FragmentStatePagerAdapter as mentioned above. 3-i overrided the getItemPosition() in mPagerAdapter and make it return POSITION_NONE. I have encountered this problem and finally solved it today, so I write down what I have learned and I hope it is helpful for someone who is new to Android's ViewPager and update as I do. I'm using FragmentStatePagerAdapter in API level 17 and currently have just 2 fragments. I think there must be something not correct, please correct me, thanks. Serialized data has to be loaded into memory. This can be done using a CursorLoader/AsyncTask/Thread. Whether it's automatically loaded depends on your code. If you are using a CursorLoader, it's auto-loaded since there is a registered data observer. After you call viewpager.setAdapter(pageradapter), the adapter's getCount() is constantly called to build fragments. So if data is being loaded, getCount() can return 0, thus you don't need to create dummy fragments for no data shown. After the data is loaded, the adapter will not build fragments automatically since getCount() is still 0, so we can set the actually loaded data number to be returned by getCount(), then call the adapter's notifyDataSetChanged(). ViewPager begin to create fragments (just the first 2 fragments) by data in memory. It's done before notifyDataSetChanged() is returned. Then the ViewPager has the right fragments you need. If the data in the database and memory are both updated (write through), or just data in memory is updated (write back), or only data in the database is updated. In the last two cases if data is not automatically loaded from the database to memory (as mentioned above). The ViewPager and pager adapter just deal with data in memory. So when data in memory is updated, we just need to call the adapter's notifyDataSetChanged(). Since the fragment is already created, the adapter's onItemPosition() will be called before notifyDataSetChanged(） returns. Nothing needs to be done in getItemPosition(). Then the data is updated. Try destroyDrawingCache() on ViewPager after notifyDataSetChanged() in your code. I keep references to the fragments created in getItem in an array. This works fine as long as the activity is not destroyed due to configurationChange or lack of memory or whatever (--> when coming back to the activity, fragments return to their last state without 'getItem' being called again and thus without updating the array). Define which message which is needed to update. Write below code in the Fragment which is needed update. If you want to use FragmentStatePagerAdapter, please take a look at https://code.google.com/p/android/issues/detail?can=2&start=0&num=100&q=&colspec=ID%20Type%20Status%20Owner%20Summary%20Stars&groupby=&sort=&id=37990. There are issues with FragmentStatePagerAdapter that may or may not trouble your use case. Also, link has few solutions too..few may suit to your requirement. I have lived same problem and I have searched too much times. Any answer given in stackoverflow or via google was not solution for my problem. My problem was easy. I have a list, I show this list with viewpager. When I add a new element to head of the list and I refresh the viewpager nothings changed. My final solution was very easy anybody can use. When a new element added to list and want to refresh the list. Firstly set viewpager adapter to null then recreate the adapter and set i to it to viewpager. I had been trying so many different approaches, none really sove my problem. Below are how I solve it with a mix of solutions provided by you all. Thanks everyone. I only want to refresh page 0 after onResume(). In my FragmentsMain, there is public integer "page", which can tell me whether it is the page I want to refresh. This solution won't work for everyone, but in my case, every Fragment in my ViewPager is a different class, and only one of them ever exist at a time. With this constraint, this solution is safe and should be safe to use in production. If you have multiple versions of the same fragment, you can use this same strategy to call methods on those fragments to determine if it is the fragment you wish to update. This might be of help to someone - in my case when inserting a new page the view pager was asking for the position of an existing fragment twice, but not asking for the position of the new item, causing incorrect behaviour and data not displaying. Copy the source for for FragmentStatePagerAdapter (seems to have not been updated in ages). I've gone through all the answers above and a number of others posts but still couldn't find something that worked for me (with different fragment types along with dynamically adding and removing tabs). FWIW following approach is what worked for me (in case anyone else has same issues). Here is my implementation that incorporates the info from @Bill Phillips One gets fragment caching most of the time, except when the data has changed. Simple, and seems to work fine. How to update ViewPager content? 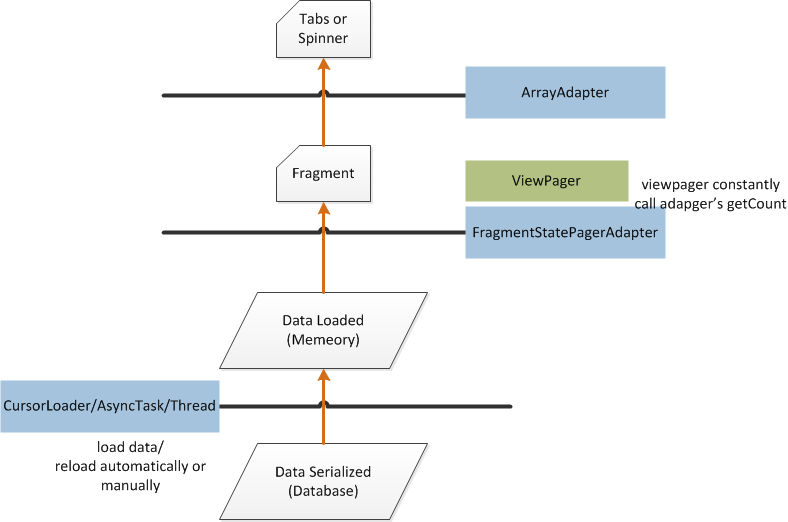 What causes a fragment created by a FragmentPagerAdapter to still be known to FragmentManager after the adapter calls onDestroy?